In a certain light, episode 18 of Persona 5: The Animation can be viewed as fairly commendable. 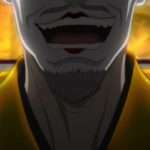 It tries to cram as much content as it can within a single episode, possibly in an attempt to quickly set up the next arc. Sadly, it does this at the expense of quality, with scenes (important or minor) largely being glossed over. Take, for example, Futaba’s rehabilitation. In the game, the Phantom Thieves work hard towards getting Futaba to reintegrate into society. 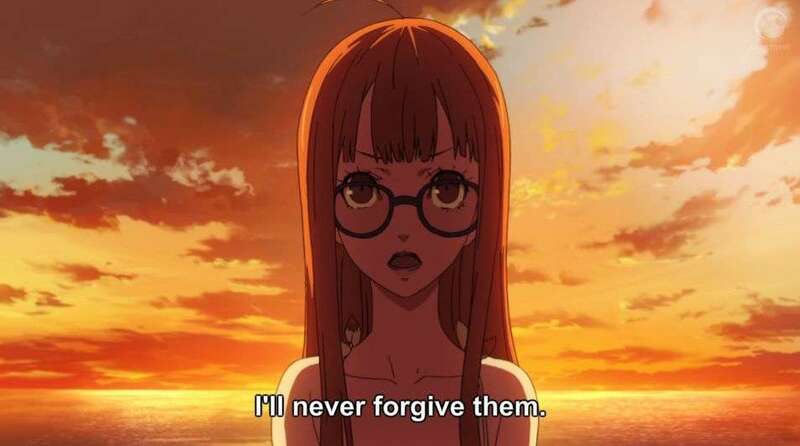 The game is painstaking with this process, and the end result is the genuine sense that Futaba improves as a person. The anime fails to convey this at all, instead, speeding through her rehabilitation process in a way that doesn’t make it seem like Futaba has changed at all. 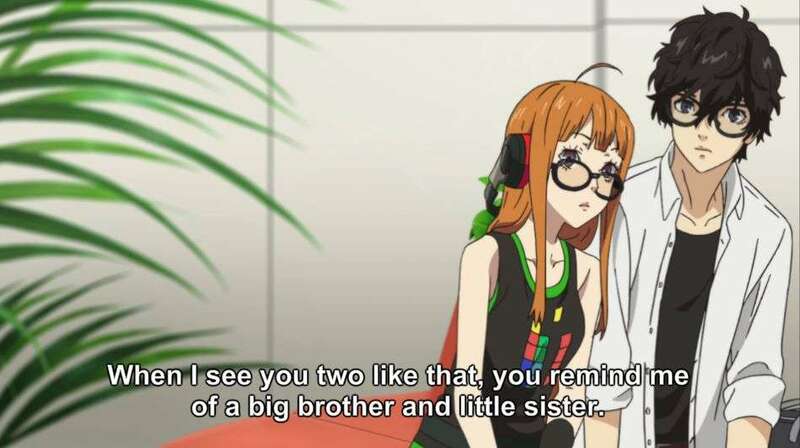 In fact, Futaba in the anime seems a lot more put together compared to her game counterpart. Even her goofy mask, which signaled her unease around people she wasn’t familiar with, is essentially treated as a two-second gag. The beach scene similarly suffers, with the first half, effectively being an underwhelming montage (though it’s worth noting that the homophobic gay stereotypes were removed, so points for that). Something that perfectly conveys my point is the Yusuke lobster scene: a beloved and hilarious moment from the game in which Yusuke proudly displays the expensive lobsters he bought. 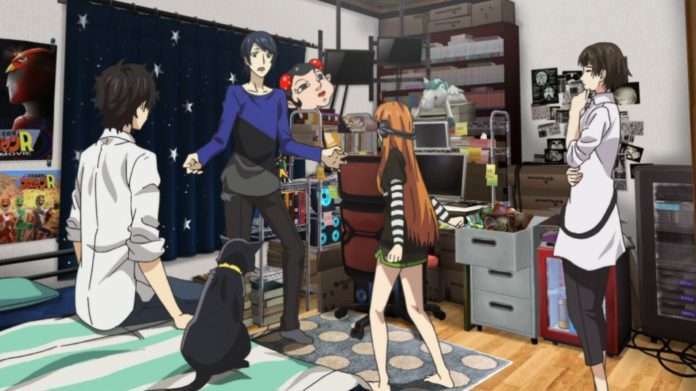 Futaba is transfixed by them and immediately tries to grab them, but Yusuke doesn’t want any of that and tries to keep them away from her. 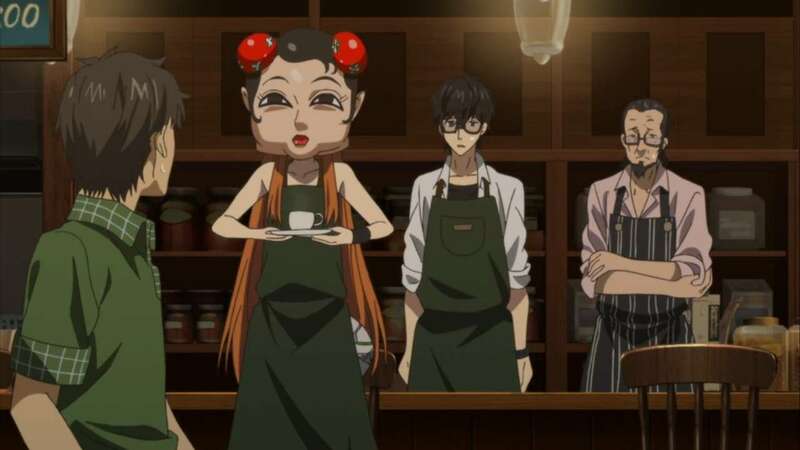 The scene was great because it was a triple whammy: a showcase of Futaba slowly warming up to others, a good instance of the individual Phantom Thieves bonding, and it was just plain hilarious. That scene is technically present in the anime, though only in the sense that Yusuke is simply carrying the lobsters and that’s the joke in its entirety. None of what I previously mentioned was carried over from the game. You’d think they put more effort into the beach episode (the go-to fanservice staple), but outside of a few horny shots of the girls, you get the sense that they didn’t really put much effort here. The second half of the beach sequence fares a bit better, but it lacks the emotional impact the game had. I think part of this just comes down to the music choice; the anime original track just doesn’t fit the tone of the scene all that well. This has been an ongoing issue in the anime, but it’s particularly pronounced here. The episode also covers the opening part of Futaba’s “confidant,” but just like with the rest of the episode… it completely rushes through it. There’s no setup, no list of things Futaba wants to overcome, and a critical aspect of her character is missing. 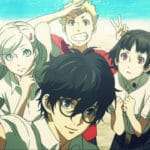 In the game, Futaba becomes dependent on the protagonist, and a significant part of her “confidant” arc has her learn to get by without him. The episode doesn’t really cover that, and it loses the general progression present here. The scene where Futaba goes to Akihabara is done a lot better in the game because there’s a build-up to it. Futaba feels that she’s confident enough to go out on her own, but has a really bad experience because recovery can’t just happen in one go. These things take time. The anime mostly treats it as a gag scene, but it hits a lot harder in the game because you genuinely feel bad for her. 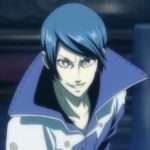 Integrating Ryuji into that scene was a good touch, but there’s a level of intimacy that’s lost with that decision. With all that said, the episode wasn’t completely without merit. The anime (so far anyway) has done a much better job of signaling Morgana’s growing insecurity and frustration with his place in the group. I didn’t care for his overt whining in the game, but the anime does a good job of endearing us to his sadness. 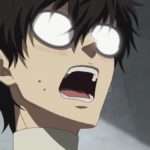 Morgana feels sad and alone, with nobody else in the group noticing and, in Ryuji’s case, actively making him feel worse. Only Ren is able to pick out his sadness, and the scene in which he assuages his fears is legitimately touching. As far as other characters go, Ann’s “confidant” storyline is introduced, and it’s handled in a bit of a weird way. The show opts to segue into the middle of Ann’s “confidant,” without building up to it. Like at all, which is a shame because Ann has a lot of great friendship moments in her storyline with Ren, though it’s possible they’ll still cover them in later episodes. Overall, while I understand the need to quickly cover content, a lot of good moments were lost as a result of that decision, and that’s a big shame. Episode 18 wasn’t a bad episode, but it was definitely a disappointing one, and hopefully, the rest of the anime benefits from its sacrifice in quality.